If you've ever felt guilty about your goldfish having to swim around in a cramped bowl, Takuro Yamamoto Architects designed this stunning coffee table aquarium that lets them traverse the entire world. Albeit, a very, very small version of the world. 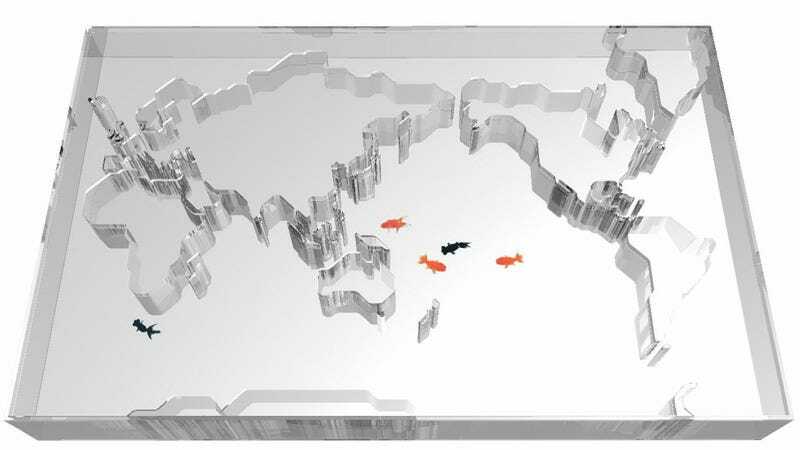 The firm's World Trip aquarium was created as a submission for designboom's TIFF awards, and appears to be made from clear lucite that's been intricately cut into the shape of the continents. Well, to be more specific, the aquarium actually appears to be made from 1s and 0s since we're pretty sure this is a concept render and not a functional prototype. Which is really infortunate, because standing ominously over a fish tank shaped like the entire world would really help bolster your feeling of superiority over its tiny fish inhabitants.